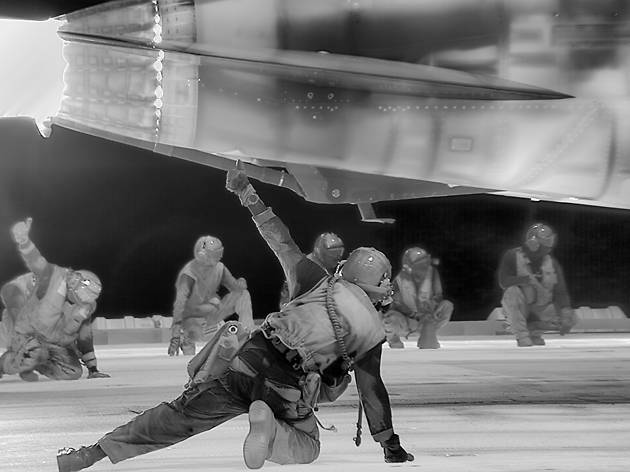 Richard Mosse, Still frame from 'Incoming', 2015–2016. Courtesy of the artist, Jack Shainman Gallery, New York and carlier|gebauer, Berlin. There’s two things you need to know about this show. One: it will make you rethink the European refugee crisis. And two: it contains some of the most beautiful images you will see in a gallery this year. Or ever. Paradoxically, it achieves both these things thanks to some very non-touchy-feely battlefield technology. In his last major installation, ‘The Enclave’, Mosse used film stock that rendered greens as reds, casting the jungly confusion of the war in the Congo as gorgeously, defamiliarisingly pink-hued. This time, the images are all black-and-white, but taken with a camera that responds to heat, rather than light, and which can pick out a human body 30km away. Of course, the major application for it is military, but Mosse uses it to document the experiences of refugees and the results are startling. At the heart of the show is the title piece, ‘Incoming’, a three-screen video projection accompanied by a soundscape of electronic drones and field recordings by Ben Frost. It runs for nearly an hour, but you quickly lose all sense of time. The footage includes scenes we’re all accustomed to: knots of men behind wire fences, people in rubber boats, police in riot gear. But the effect of the heat-sensitive technology is breathtaking: the images are pin-sharp, full of contrast and detail, but profoundly ‘other’. You struggle to read them – especially across three screens – while marvelling at their abstract beauty and moments of delight: a gull flies across a beachscape; a warm handprint remains on a blanket. Mosse flicks between positive and negative: sometimes warm faces and hands are dark, sometimes bright white. ‘Real’ skin tone is irrelevant. One of the major causes of death among refugees is exposure, and ‘Incoming’ makes us question which parts of the images we’re seeing are the hypothermic ones. People are pulled from the water and swaddled in foil wraps. At the other end of the spectrum, there are white hot fighter jet exhausts and out-of-control campfires. Heatwise, this is a world of total extremes. Humanitarian disasters are tough for artists: get too close and you look like you’re making a moral point; stand too far away and you risk leaving the viewer cold. See? Cold. Mosse makes the viewer literally decide what’s hot and what’s not. As you read huge landscapes looking for a spark of life, or work out which parts of a person are frozen or baking, you are re-analysing a political crisis using the most basic physical criteria. That those criteria also create such ravishing art is a quite unbelievable achievement. Sometimes a good photo doesn't need to be in focus, and often the camera needs to be invisible. In this case, it plays a major role. While not overtly political, it is difficult to disengage. The use of thermal imaging is not unfamiliar to civilians, however the exposure of them in pop culture are limited to films such as the Predator franchise, or Zero Dark Thirty. By using these tools to capture scenes of every day life, or refugee camps, it presents a powerful assemblage from what we associate as cinema to reality. Set some time to sit through the hour long film if you can. Richard Mosse is an incredibly talented Irish conceptual documentary photographer. This installation at The Barbican documents the refugee crisis and the largest exodus and movement we have seen since the Second World War. He uses military surveillance thermographic cameras that can detect heat at long distance to produce images of refugees boarding rescue boats, huddled near the shore in coastal cities, or in the limbo make shift camps. Drawing our attention and awareness to the persecution of their own citizens by Syria and Afghanistan during the largest humanitarian crisis of our lifetime. The images are projected onto three huge 8 meter screens and you can sit and spend as much time as you like pondering the moving and poignant images. The success of this piece is its ability to connect and bring awareness without any commentary, purely through these touchingly powerful unique luminescent black and white images. I'm at the stage now where I trust that anything showing at the Barbican's Curve Gallery is worth seeing - not least because it is free to the public and always fascinating to see just what they decide to do next with this meandering space. I knew very little of what Richard Mosse was showing here and remember worrying upon first sight of the large, leading black & white photographs at the entrance that it looked a little sparing, but I was soon rewarded when I found my feet following the darkness of the curve toward the deep crescendo of sound that was mysteriously reverberating through the curve. What awaits are three 8 metre screens mounted alongside each other, each relaying sequenced, incredibly high-definition and slow-moving thermographic footage. The succession of imagery is compelling, oftentimes stunning, at times difficult to watch and yet impossible to ignore - the near hour of footage melted away before me. The subject matter is particularly poignant and this piece, despite technically being filmed sometimes from a distance of 30km and feeling detached from any obvious political standpoint, will shed a new light on the refugee crisis that seems to be fading fast from public attention. It is a haunting and necessary artwork that I will you to go and see.